Parking is readily available in the large parking lot between the commercial area to the south and the State Recreation Area to the north (see on Map). From the parking lot, go west to the Greenway trail. This multi-use trail runs close to the river, from the Sorlie Bridge to the Kennedy Bridge. A portion of Sherlock Park lies within the dike and is located across 4th Street NW from the campground. The State Recreation Area is quite large and is dominated by a variety of mature trees, especially bur oak and basswood. It occupies the former Sherlock residential neighborhood and may well be the best and most accessible area for woodland passerines on either side of the Red. As is true of other segments of the Greenway, most of the area between the multi-use trail and the river is being allowed to become naturalized. During the nesting season, Red-headed Woodpecker, Eastern Bluebird, Clay-colored Sparrow, Song Sparrow, and Indigo Bunting may be found along the trail. The recreation area with its mature trees is a good place to find permanent residents, especially Downy and Hairy Woodpeckers, Black-capped Chickadees, and White-breasted Nuthatches. 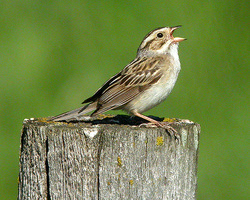 The diversity of habitat attracts a diversity of migrant song birds during migration.